Nikola Mirotic was at his best in leading Real Madrid to a memorable 104-105 overtime victory over Zalgiris Kaunas at Zalgirio Arena on Thursday night. Mirotic forced overtime when he grabbed an offensive rebound and sank 2 free throws with 3.4 seconds left in regulation to tie the game at 84-84. He then nailed a big three with 33 seconds left in overtime and added 2 more from the line to make it 94-101, essentially sealing a monumental victory. Mirotic finished with 31 points, 11 rebounds and 2 blocked shots. He set a new Euroleague record for free throws made and accuracy by going 18 for 18 from the line. The win kept Los Blancos in first place in Group E with a 9-1 record. Madrid will mathematically advance to the playoffs if Panathinaikos beats Unicaja Malaga on Friday. 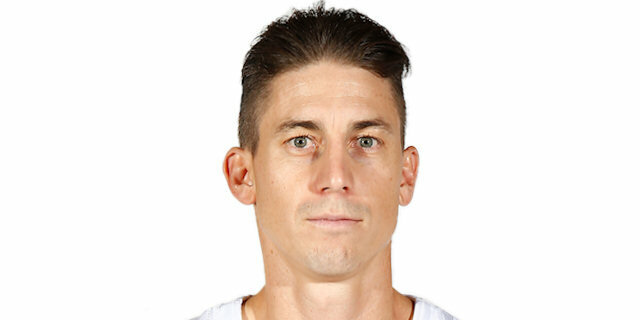 Jaycee Carroll added 21 points for the winners, Sergio Llull compiled 14 points and 5 assists, Rudy Fernandez scored 11 and Sergio Rodriguez tallied 10 points and 8 assists. Zalgiris, which led by as many as 14 in the third quarter and 7 with less than two minutes to go, dropped to 4-6 in losing to Madrid by 1 point for the second time. Tremmell Darden finished with 20 points for the Lithuanian champs, Mindaugas Kuzminskas scored 16, Ksistof Lavrinovic 14 and Oliver Lafayette had 13 points and 5 assists. Both teams were hot from the perimeter early. Darjus Lavrinovic opened the scoring from behind the arc, before triples by Fernandez and Llull lifted Madrid to 5-6. Mario Delas found a cutting Darden for a slam and Lafayette connected from downtown to make it 10-6. Lafayette added a floater, but the visitors stayed close on two more Llull triples. Lafayette countered with two more triples of his own as the local fans cheered on to a 22-14 advantage. After a timeout, Darden made it a 10-point game and Fernandez forced up an airball. Robertas Javtokas converted a basket-plus-foul to cap a 10-point run. Carlos Suarez with 3 points over two possessions and Felipe Reyes narrowed the gap to 29-19 through 10 minutes. Mirotic added a triple and Carroll a floater as Madrid scored 7 straight points to close within 31-26. Donnie McGrath’s pull-up jumper and a Popovic layup restored a comfortable Zalgiris edge. Ksistof Lavrinovic attacked the rim, got to the line and extended the lead to double digits. Popovic fired in a triple to make it 40-26. Mirza Begic scored inside for the visitors before a TV timeout stopped the action. Rudy, on the offensive glass, and Mirotic, from the line, kept the fight for Madrid. Delas fired in a three to keep the Kaunas faithful singing. 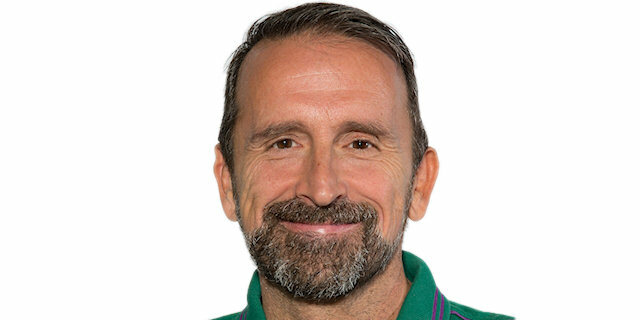 Carroll and Lull nailed a pair of triples in rapid succession to close the gap to 43-38, which caused Zalgiris coach Joan Plaza to call timeout. The hosts failed to capitalize on four trips to the line – making only 1. Carroll corrected a missed Fernandez layup to make it 44-40. 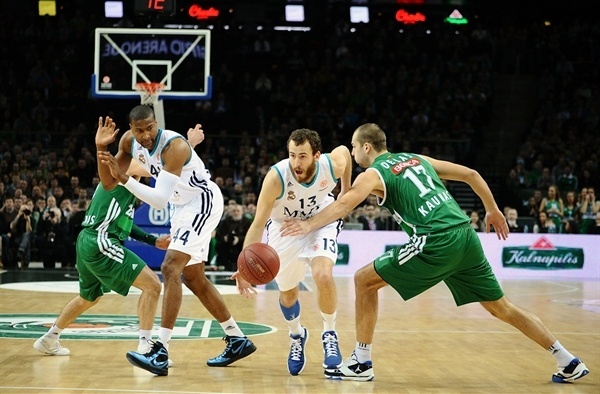 The momentum shifted squarely back to Zalgiris early in the third quarter. Darden hit a triple on the hosts’ first possession, and then a Ksistof Lavrinovic steal led to an unsportsmanlike foul committed by Llull on Lafayette. After the resulting free throws and a jumper by Darden, the lead was 11. Mirotic kept Madrid in the game with 4 points and a pair of rebounds. Rudy knocked down a three from the top of the key… And then another a minute later as Madrid closed the gap to 54-40 midway through the quarter. 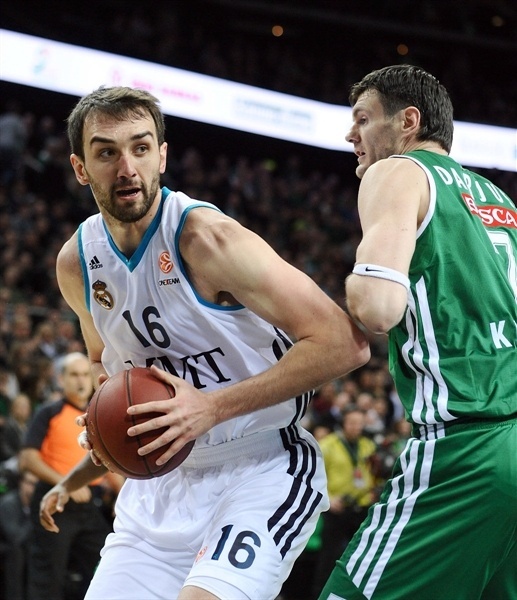 Mirotic got Madrid 2 more points from the line as Zalgiris continued its sudden offensive woes. Ksistof Lavrinovic ended a three-minute Zalgiris drought with a pair of free throws, but Carroll knocked down a three to make it a 1-point game. Rodriguez gave the visitors their first lead since the opening minutes with a triple before Rudy fed Marcus Slaughter for an alley-oop slam and a 56-60 lead, capping a 2-20 march. Ksistof Lavrinovic restored some Zalgiris hope and after Mirotic and McGrath traded triples, it was 61-63 with one quarter to go. Rimantas Kaukenas tied the game and after a Carroll basket, Kuzminskas did so again with a baseline jam, 65-65. Almost three minutes into the quarter, Kuzminskas put the hosts ahead only for a long Dontaye Draper jumper to even things at 67-67. Popovic made a deep triple to the delight of the local fans. Darjus Lavrinovic spotted Kuzminskas near the rim for a slam and a 5-point lead. Madrid missed a chance to close the gap when Reyes missed 2 free throws. Carroll came off the bench and drained a three to make it 72-70 with four minutes to play. Fernandez limped off after hurting his leg trying to save a loose ball. Kuzminskas further established himself as the hero of the fourth quarter with a three to make it 77-70 with 2:40 remaining. Reyes and Mirotic brought Madrid back within a shot with a combined 4 free throws. 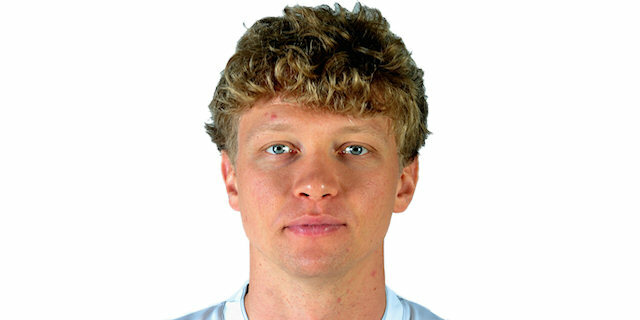 Kuzminskas banked in a shot on a broken play and pulled in a big rebound to keep his team up. Darjus Lavrinovic extended the difference to 81-74. After a timeout, Darjus Lavrinovic fouled out with 1:10 remaining, Slaughter split free throws and Llull penetrated as Madrid came back. Mirotic made 2 free throws for an 81-79 edge with 32.7 seconds remaining. Madrid sent Deal to the charity stripe and he made 2 with 18.2 seconds left, making it a two-possession game. After Mirotic swished free throws, Madrid sent McGrath to the line at 83-81 with 9.5 seconds left. He made the first, but missed the second. Rodriguez was fouled and went to the line with 4.8 seconds to go. He made the first, intentionally missed the second and Mirotic was first to the ball, was fouled by Delas with 3.4 seconds and sank 2 free throws to tie the game at 84-84. Popovic could not get a clean shot off and the game went into an extra session. Carroll opened the overtime period with a triple from the corner. After Ksistof Lavrinovic scored from the line, Rodriguez found Mirotic for a slam and an 86-89 Madrid lead. Darden tied the game on the next possession. Moments later, Darden threw down a viscous two-handed slam dunk as the crowd roared in approval, but Slaughter tied the game at 91-91 on the next play. Rodriguez put the visitors ahead with a steal and layup. Javtokas, stuck with the ball on the three-point line and with the 24-second clock running down, nailed a three-pointer. Carroll matched him, 94-96 with a minute and a half to go. Mirotic practically sealed the outcome with a three from the corner with 33 seconds left. After Popovic missed inside, Mirotic went to the line and set a new Euroleague record for free throws made in a Euroleague game as he iced the win. Zalgiris still tried to get back and a Kuzminskas triple and Ksistof Lavrinovic steal and layup made it a 1-point game with 0.5 seconds left, but Madrid inbounded the game and clinched the win. "I want to say that I’m proud of this club, this city, these players. It was great spectacle for TV, for the fans and for all lovers of basketball. If we look at the stats, we shot better from every position, but we lost by 1 point. Nobody can blame the team, because they gave everything on the court. I wasn’t here last season, but I think a lot has changed this year. Last season Zalgiris won only four games in whole season and all the teams coming here were coming just to pick up a victory. Now we have much better results and all teams that come here have to fight a lot. Today we played against one of the best teams in Europe and none of our players are free of mistakes." "First I want to congratulate my team. It was a special game. We had won it, lost it, won it, lost it and finally won it. I want to thank my players for not giving up when we were down by 7 points in the last minute. It was an amazing atmosphere. I have played before here in Lithuania and I knew how great this city of basketball is. I was proud to be a part of this game. We are happy to go back to Madrid with a win, which will help us in the fight for the best position in the group." "I don’t even know what to say. We deserved to win one more game in the Top 16, but again luck wasn’t on our side. We played good for 39 minutes, but for the last minute it seemed that someone changed us. We made such mistakes, which even kids don’t do. We were in a situation which we had to use for ourselves, but we couldn’t and it’s a bit sad. But we can’t turn back the time, so we have to analyze our mistakes and get better." 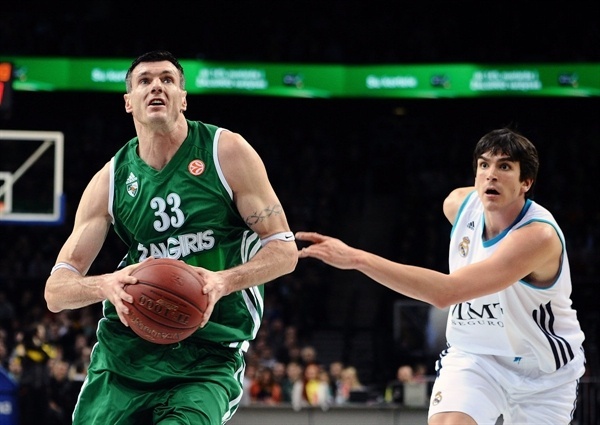 "Zalgiris started very good, with good shots. They were hungry and we were a little behind defensively, but in the second half we picked up our defense as a chance to come back and to score easy baskets. Personally I enjoyed this game. My teammates made good penetrations and passed out where I was able to make some shots. But all in all it was great atmosphere. I heard that it is a very good basketball country, basketball city and I was very impressed and I am very proud of being a part of this game. We always come out as a team, we always want to win, but when other team is fighting with a team who is in a first place, they want to catch you, and do it harder than usual, but this is normal."